I don't know anything about the label aufnahme + wiedergabe or the artist Imperial Black Unit. I found this release while browsing Bandcamp and really liked the name, though I don't know what it means. It sounded tough and frightening, harsh and gritty. The label's name means "recording + playback", and they, along with the duo who created this release, are based in Berlin, Germany. The cover art looks like the small label on the center of a record. It could also be a picture disc. Going along with the aesthetics of industrial and EBM (Electronic Body Music), this shows a figure in a biochemical suit holding a Molotov cocktail in greyscale. A regal building appears behind him in another layer. It's okay, very true to form, and that might be the best way to describe this release overall. &lt;a href="http://aufnahmeundwiedergabe.bandcamp.com/album/state-of-pressure"&gt;State Of Pressure by Imperial Black Unit&lt;/a&gt; State of Pressure starts off with the title track. It's hard-hitting beats and warped vocal grunts and cries make me want to dance hard. I like the drum fills, cutting through the mix, and the buried arpeggios; the distant voices, lost in the void, add a frightening paranoia to the track. "The White Rose" starts with some frenzied cries that make me uneasy. The pulsing music builds into a similar rhythm to "State of Pressure" before the song adds a symphonic chorus hidden behind a veil and a running chiming lead. "Philosophy of a Knife" starts off the B-side. I didn't like this one at much. It hits a little too hard for me to really enjoy it. I'm not a fan of those harsh yells, and the synths are not much to talk about either. There was some really cool textural creepings happening at some points though. "Now You Can Pray" starts out with some really hard four on the floor, and, though it changes, it doesn't let up. The synths sweep throughout, curtains in a hot room of scaly men. 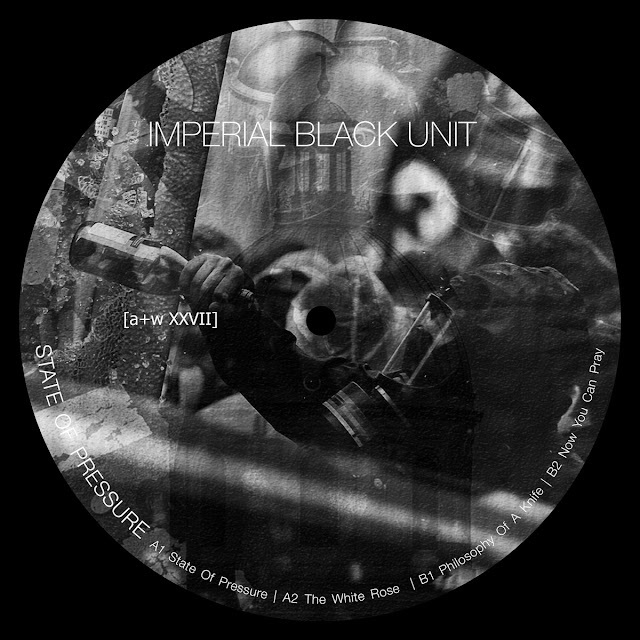 State of Pressure is a decent release from Imperial Black Unit. As someone who doesn't listen to a ton of EBM, techno, and industrial, this doesn't do a lot for me. I liked the A side but not the B side. Mostly I don't like the harsh vocals. The first half had some very interesting compositions, different instruments producing greater wholes from their parts. State of Pressure gets a Neutral.